In recent years the number of albums being released which center on devotional singing, chanting mantras, kirtan, etc. has been on the rise. This is a good indication that more and more spiritual seekers are looking to sound and music that goes beyond entertainment, and which can be used as a tool for inner attunement. 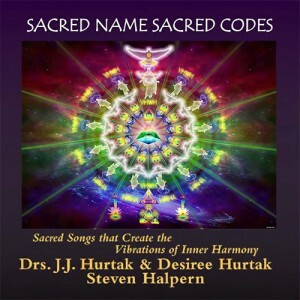 “Sacred Name Sacred Codes” by Drs. J.J. Hurtak and Desiree Hurtak, which features a musical soundtrack well known new age music pioneer and sound healer Steven Halpern is a new entry into this genre, although based on very ancient teachings. The album opens with a track called “Prologue,” set to Steven’s ethereal synthscape, along with soft female voices chanting the Divine Name of YHWH. This creates serene and sacred backdrop for an introduction and invocation, first by J.J. Hurtak and then by Desiree Hurtak speaking of the power of Sacred Language and its relationship to our Higher Self, the blueprint of our DNA, and more. Following this are 9 tracks of the Sacred Names chanted in Hebrew. J.J. Hurtak beautifully chants the Sacred Names in a rich and powerful voice that along with the other voices form a majestic angelic choir that is quite moving and is further enhanced, or should I say entranced, by Steven’s celestial keyboard arrangements. Some tracks are more predominately female vocals, while some are more male focused, as well as those, which blend together like yin and yang. The album is beautifully recorded and produced, capturing the deeply spiritual intention of the project. The CD comes with an informative 12-page booklet that delves into the science and metaphysics behind this music. I will say that this is not casual reading and can be quite deep in places. While “Sacred Name Sacred Codes” can be esoteric to some, for those who feel the calling and find resonance within, it is a profound and divinely inspired tool for spiritual transformation.